A smart grid is envisioned to enable a more economic, environmental friendly, sustainable and reliable supply of energy. 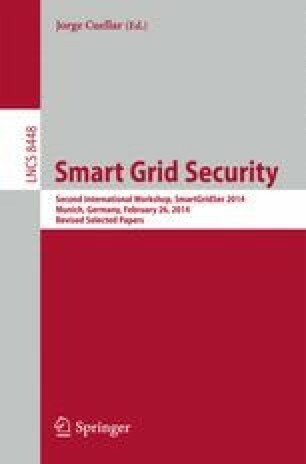 But significant security concerns have to be addressed for the smart grid, dangers range from threatened availability of energy, to threats of customer privacy. This paper presents a structured method for identifying security threats in the smart home scenario and in particular for analyzing their severity and relevance. The method is able to unveil also new threats, not discussed in the literature before. The smart home scenario is represented by a context-pattern, which is a specific kind of pattern for the elicitation of domain knowledge . Hence, by exchanging the smart home pattern by a context-pattern for another domain, e.g., clouds, our method can be used for these other domains, as well. The proposal is based on Microsoft’s Security Development Lifecycle (SDL) , which uses Data Flow diagrams, but proposes new alternatives for scenario definition and asset identification based on context-patterns. These alleviate the lack of scalability of the SDL. In addition, we present Attack Path DFDs, that show how an attacker can compromise the system. Part of this work is funded by the German Research Foundation (DFG) under grant number HE3322/4-2 and the EU project Network of Excellence on Engineering Secure Future Internet Software Services and Systems (NESSoS, ICT-2009.1.4 Trustworthy ICT, Grant No. 256980).